Hi everyone! This is a repeat post. Sorry about that but, we have been without internet since last night and I was caught off guard. But, this is a good one to repost since, I am redoing this little tin hanging basket-ish thing for a little splash of spring. When I get it redone, I will show ya how it turned out. It's Pink Saturday already! Wow, this week went by so quick! Stop by and visit Beverly at How Sweet the Sound And check out everyone else's pinks for the week! My pink is just a little find found at Salvation Army a couple of month ago. 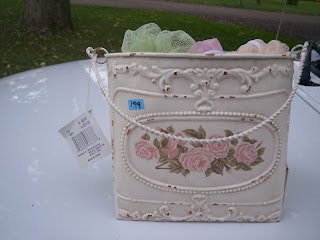 It's just a little "Shabby Chic" metal wall basket with pink roses on the front. It was brand new with the Michael's tags for $9.99 still on it. It as marked $1.99 but,it was blue sticker day so it was half off. It even had the original shower puffs in it still connected to the price tag. I'm not sure what I am going to do with it yet. But, I thought it was pretty and a great price. One of these days I WILL get to go shopping with you! Adorable! I agree, great find! Happy Pink Saturday! Good Grief!! I Love, love, love this wall basket! So pretty and pink too! Oh, I love it. Lucky you. Happy Pink Saturday. 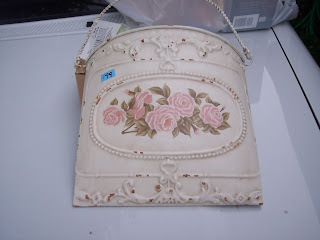 It is very pretty and I could so see that being used to do a tea party! Diann, love the wall basket/bucket. I have some (in green) and love them, yours is so pretty with the pink roses. Great find. Hi Diann, happy P.S. a day late..we were so busy yesterday buying and planting plants in the yard, friends stopped by and we went out to lunch and I had to nap, to didnt get to very many Pinks yesterday.. I love love love the wall basket..that is the DEAL of the year..why don't I see these things when I am out and about??? hehe..
Glad you got your Internet back in time to post.